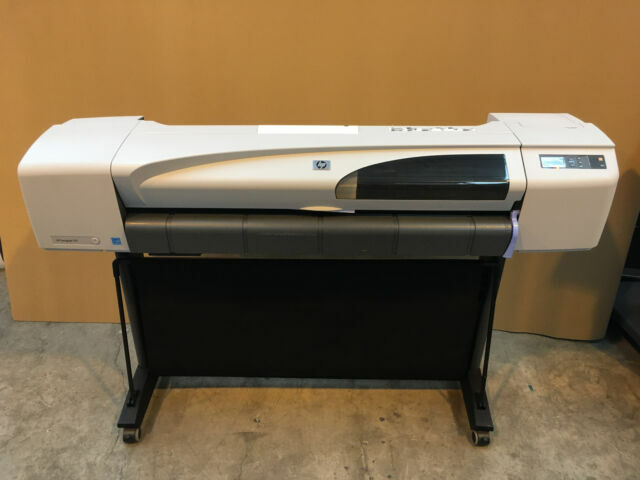 HP DesignJet 510. 1 x HP DesignJet 510. USB, Parallel & Ethernet Connections. Stand ,Paper Catcher,and Automatic Cutter Included. USB & Parallel. Up to 55 seconds per page Colour Print. Printer Specification. With HP colour layering technology, a Hewlett Packard printer can provide high quality prints in a short amount of time. The Hewlett Packard DesignJet 510 has a maximum print resolution of up to 2400 by 1200 dpi for both colour and black and white projects. The speed that the large-format thermal printer can produce pages depends on the project, but the average times are between 55 seconds per page for lower resolutions and 16 minutes per page for higher resolutions. The Hewlett Packard printer uses both dye-based and pigment-based inks, which allow it to successfully print on multiple types of media, including coated, film, adhesive, and canvas. The Hewlett Packard DesignJet 510 is a heavy-duty printer that weighs about 45 kg. As a stand-alone, large-format thermal printer, it can accommodate large rolls of media as well as single sheets of paper as necessary. Unlike some other printers, the Hewlett Packard printer is compatible with Macs and PCs using the USB 2.0 interface.